MILPITAS, Calif. - March 9, 2018 - PRLog -- Phenolic compounds are phytochemical secondary metabolites found abundantly in dietary and medicinal plants, vegetables and fruits. Major types of phytochemical phenolic compounds include simple phenolic acids (such as gallic acid and vanillic acid), flavonoids (such as catechin), stilbenoids, lignans and various highly complex polyphenols (proanthocyanidins and tannins). These compounds play an important role in plant defense against ultraviolet radiation, serve as a deterrent to herbivores and also act as signaling molecules in ripening and other plant growth processes. Both simple phenolic acids and complex polyphenols are found in high concentrations in foods and beverages such as berries, vegetables, cereals, coffee, tea and wine. Phenolic compounds, being antioxidants, have been increasingly studied in dietary sources, due to their protective effects against cardiovascular diseases, cancer and neurodegenerative diseases. Studies have also shown dietary polyphenols to possess antimicrobial, anti-inflammatory and anti-allergic properties. BioVision's Phenolic Compounds Assay Kit provides a quick, sensitive and selective method for measuring the total amount of phenolic compounds in various biological samples. In this assay, phenolic compounds couple with diazonium salts under alkaline conditions to form a stable diazo chromophore, detectable by absorbance at 480 nm. Unlike the classical Folin-Ciocalteu (FC) protocol for measuring phenolic compounds, our assay is not affected by non-phenolic reducing substances such as sulfites, reducing sugars or ascorbic acid. 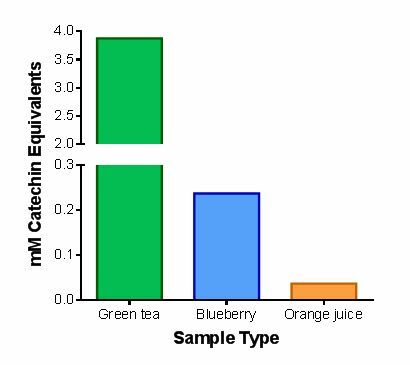 The assay is high-throughput adaptable and can detect concentrations of phenolic compounds as low as 0.02 mM catechin equivalents (CEs) from a variety of plant and food-based samples. Figure: Figure: End-point fluorescence in 3T3-L1 adipocytes in the presence of ascending doses of insulin (0, 25 and 250 nM), as well as a mixture of insulin and wortmannin (250 nM + 5 μM). Fluorescence was measured 60 minutes after the addition of Uptake Reaction Mix. Data are mean RFU ± SEM of 4 independent plates, with each data point representing the mean of quadruplicate wells.